Honda CB300R is a neo-retro style street machine from Japanese bike maker. It features design language inspired from its lineup litre class naked sibling, the CB1000R. Here in India, the motorcycle hits the exclusive Honda Wing World dealerships via CBU route, for which the company asks the price sticker of INR 2.41 lakh ex-showroom (New Delhi). 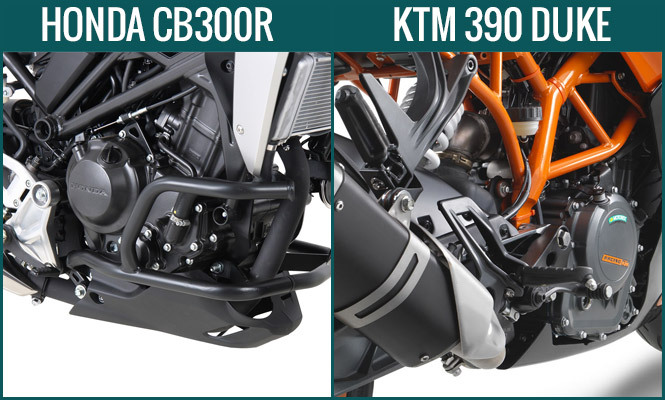 In its segment, the motorcycle slots in between Honda CBR250R and KTM 390 Duke. while seeks rivalry with the Royal Enfield Interceptor 650 also based on price concerned. 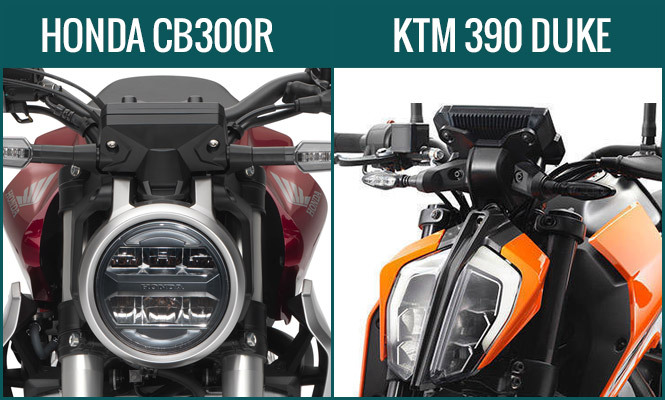 We are here to have a glance at a quick comparison of Honda CB300R and KTM 390 Duke. Honda CB300R that sits on a steel diamond frame is a low-weight motorcycle with a kerb weight of just 143kgs. 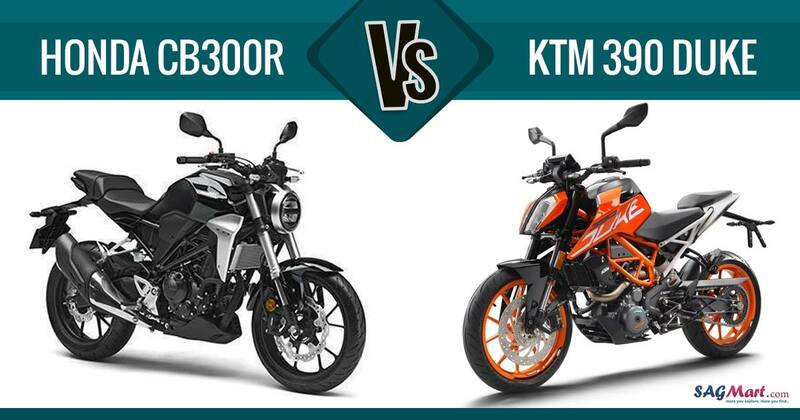 It is almost 20kg lighter as compared to its rival KTM 390 Duke which tips the scale at 163 kg. The CB300R which packs a 286cc, single-cylinder, liquid-cooled engine with fuel injection system as a beating heart, manages to be a quick offering against power output 31hp/27.5Nm thanks to its low weight. Whereas the KTM 390 Duke is the most powerful motorcycle in the segment with the maximum power of 43.5hp and peak torque of 37 Nm from the housed powertrain, a 373.2cc, single-cylinder, liquid-cooled unit. The power transmission on both the street fighters is managed by a six-speed gearbox unit. The CB300R is capable of reaching the top speed of 155-160 kmph (Approx.) along with the claimed fuel mileage of 30.2 kmpl. On the other hand, these top speed and fuel efficiency figures for the strict street machine KTM 390 Duke stands at 167kmpl (Approx.) and 28kmpl respectively. At the performance front, the KTM 390 Duke is feasible to be quick with the mentioned power specs as compared to its competitor even at low rev range. Honda CB300R can be considered as a stripped down version of the CB1000R since it follows the similar neo-modern styling with a hint of cafe racer. It gets a round headlamp, chiselled fuel tank and a minimalistic rear section. While the presence of LED headlight and beefy USD fork offers an aggressive stance to the motorcycle. The KTM 390 Duke, on the other hand, is a pure naked street performance with fierce naked styling. It features a slashed LED headlamp setup, sculpted fuel tank and narrower rear section with sharp edges all over. Constructed over a steel tubular space frame, the KTM 390 Duke suspend over a beefy 43mm WP USD forks upfront and WP monoshock at the rear. The suspension setup on the CB300R boasts of similar fitments (41mm USD forks and Monoshock) however with different performance grade. The braking responsibilities here are handled by 296mm disc up front and 220mm disc at the rear on the CB300R. Whereas, a collaboration of 320mm disc at the front wheel and 230mm disc at the rear doing the similar job on the 390 Duke. Both the motorcycles come with the rider’s aids of dual channel ABS. Available to opt from colour options Candy Chromosphere Red and Matte Axis Gray Metallic shade, the Honda CB300R is priced at INR 2.41 lakh ex-showroom. In its segment, the motorcycle sees the competition with the rivals like the KTM 390 Duke, BMW G310R, and the Royal Enfield Interceptor 650 on pricing concern. With this neo-street machine, we hope for the best for Honda as it is new and looking forward to establishing its foot in the segment.